Are We Too Heavy-Handed with the Antibiotics? When you have a child who is medically fragile, you are often faced with weighing risks and trying to determine the lesser of two evils regarding intervention and treatment. And sometimes, frankly, there are no “good” options. This has certainly been our experience in dealing with my daughter Ella’s recurrent infections. She first contracted Pseudomonas, a common but dangerous bacterium, in her trachea before we even left the hospital post-tracheotomy placement. Yes, it is common for people with trachs to become infected and colonized with Pseudomonas and other bacteria, but more research is needed to develop standard protocols for both preventing and treating recurrent infections in patients with tracheotomies. In the meantime, there are things that we as parents need to be aware of in order to potentially help avoid more problems for our children in the long run. In our case, it has been a vicious cycle of infections, antibiotics and hospitalizations for the past three and a half years. Ella has been on preventative inhaled antibiotics at home for recurrent trach infections, including both Tobramycin and Colistin. We have practiced the prescribed techniques for infection control regarding trach cleaning and care, but still the infections come. The endless parade of antibiotics, which have escalated from oral (or G-tube) to IV, has culminated in her developing highly resistant strains of bacteria, and we have found ourselves running out of options for treating active infections. The repeated use of antibiotics has not only made the bacteria more resistant, but the frequent hospitalizations have contributed to her contracting new and different organisms as well. And it’s not just trach infections. We battle recurrent urinary tract infections too due to her increasing inability to fully empty her bladder. While we struggled with implementing the right tools for keeping her bladder drained, the infections became relentless. We are also dealing with multi-drug resistant bacteria in her bladder. Now that we have ended up in this difficult place, and having learned a lot along the way, I find myself questioning the treatment of her past illnesses. There isn’t anything we can do to change where we are now, but if our experience can help other children from getting to this same place—or keep them from arriving sooner—then it’s worth reflecting on our choices and considering how things may be different had we been better educated and possibly made different decisions. Do we know what we’re dealing with? My advice is to get a culture at the first signs of illness. It will take a few days to finalize, but it’s important to know exactly what type of bacteria you are dealing with, especially in a child that has been hospitalized for any amount of time. Unfortunately, it’s far too easy and common for people to contract so-called “superbugs” while in the hospital. What should the criteria be for starting antibiotics? Starting a broad-spectrum antibiotic before the bacteria has been identified may not offer enough coverage to fully treat the infection and can contribute to bacteria becoming resistant over time. Consider how stable the child appears to be. Clinically, some things to assess would be fever (how high and whether or not it responds to fever reducers), an increased oxygen requirement, increased work of breathing, lethargy, and so on. Information from lab work is also valuable. A measure of the child’s CRP (C-Reactive Protein) and CBC (blood count) can help determine the level of infection. Do we observe inpatient or at home? If the child appears stable enough for observation before starting antibiotic therapy, an admission may be reasonable, or you may decide to watch the child at home. That decision depends on a few factors, including how stable you feel your child is, how the lab work looks, if you are comfortable performing the necessary level of care at home (i.e., neb treatments and chest percussion every four hours), and your proximity to the hospital. Of course, there are risks either way. Hospitalization could potentially expose a child to more germs, but observing at home could be dangerous if things take a turn for the worse, especially if you have a child who is extremely fragile. Hindsight is always 20/20. There is no question that antibiotics are necessary and warranted in many cases, but I think if we take into account the long term effects of excessive use and more time considering what drugs to use and when to start them, we can potentially help our children from developing highly resistant organisms which may ultimately become untreatable. As I previously said, the flip side is there is much more that could be done to help prevent infections in the first place, especially trach infections. There is no standard protocol for cleaning trachs, especially in individuals known to be colonized and who have recurrent infections. Parents are generally taught to clean trachs and respiratory supplies with vinegar/water or gentle soap/water solutions. It wasn’t until a few months ago that I learned neither method kills the most common trach bugs such as Pseudomonas. We immediately began sterilizing trachs in boiling water and managed to go several months without an infection, when previously we were seeing an infection at least every two to three months. Even at our local children’s hospital, the protocol is to wash trach tubes using a gentle soap (like Ivory) and water, which we know does not kill these bacteria. It’s obvious that more research is desperately needed for infection control. In the meantime, we as parents must educate ourselves and, along with our child’s doctors, determine the best individual plan for prevention and treatment for our own children. Please note: Check with trach tube manufacturer guidelines regarding proper sterilization techniques and always seek the guidance of a doctor or health care professional before changing your protocols. Suzanne Musial lives near Atlanta, Georgia with her husband John and their daughter Ella Grace (4). Suzanne is a stay-at-home mom/nurse to Ella and uses her background in marketing and public relations to bring parents of special needs/chronically ill children together through various online groups and forums where advice and support can be offered. In addition, Suzanne devotes her time to spreading awareness and fundraising for the Cornelia de Lange Syndrome Foundation, which is Ella’s primary diagnosis. 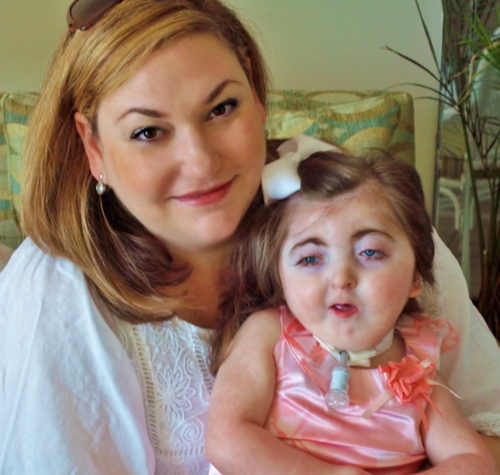 Ella’s other diagnoses and issues include tracheotomy dependence, gastrostomy tube dependence, Pierre Robin Sequence, microcephaly, GERD, seizure disorder, vision impairment and hearing loss, and she battles recurrent infections of the trachea and bladder. Ella is nonverbal but speaks volumes with her expressions and contagious smile. Visit them at www.caringbridge.org/visit/ellagracemusial/ or www.bestdressedbabyintheicu.blogspot.com. Treating Recurrent Infections: Are We Too Heavy-Handed with the Antibiotics?